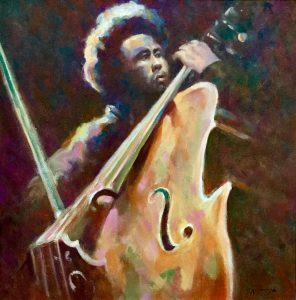 A portrait of the great Charles Mingus, a legendary composer and performer of Jazz and blues, notable for his innovative bass style and changeable moods. Trevor has used dark and light fractured colours to make up a whole tableau here. This picture captures an expression of warmth and concentration. ” I tried to get an understanding and harmony of the music in my choice of colours, like dark chocolate and orange go together, I had a copy of his tune “Goodbye Pork pie Hat ” Playing the whole time I painted this.” The boldness of colour and tone not only reflect the stage lighting but also the rhythm and mood of the music being played.